On February 25, 2014 in the administrative building of the University an expanded meeting was held which was attended by representatives of the Ministry of Health of Ukraine, Vice-Rectors, deans, heads of departments, the heads of structural units, the Student Government. representatives. Director of the Department for Work with Personnel, Education and Science, Ministry of Health of Ukraine, M. S. Osiychuk unveiled the order no. 18-ADM dated 24/02/2014 signed by Deputy Minister – the Chief of Staff, R.M. Bohachov on holding the comprehensive commission audit of the activities of the O. O. Bohomolets National Medical University. 3) to hold a comprehensive inspection of the activities of the O. O. Bohomolets National Medical University for the period within January 1, 2010 and February 25, 2014. 4) to approve the membership of the Commission on conducting a comprehensive inspection of the O. O. Bohomolets National Medical University. 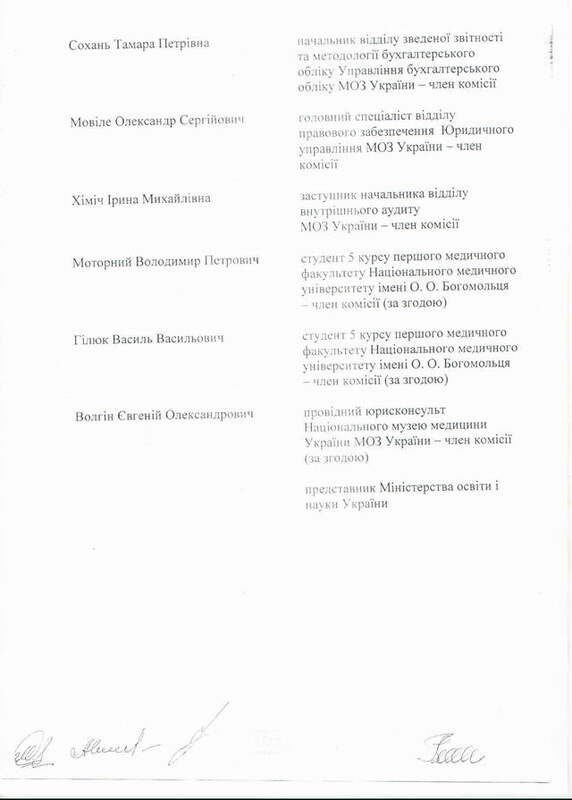 5) To appoint as the head of the commission Oleksii Oleksandrovitch Siedoy, the Head of Sector on Prevention and Detection of Corruption of the Ministry of Health of Ukraine, and to appoint as the co-chair of the commission Oleksander Mykolaiovytch Khyzhniak, the chair assistant of the Pathophysiology Department of the O. O. Bohomolets National Medical University. 6.2. submit the Certificate According to the results of the inspection to the Ministry of Health of Ukraine till March, 17 2014. 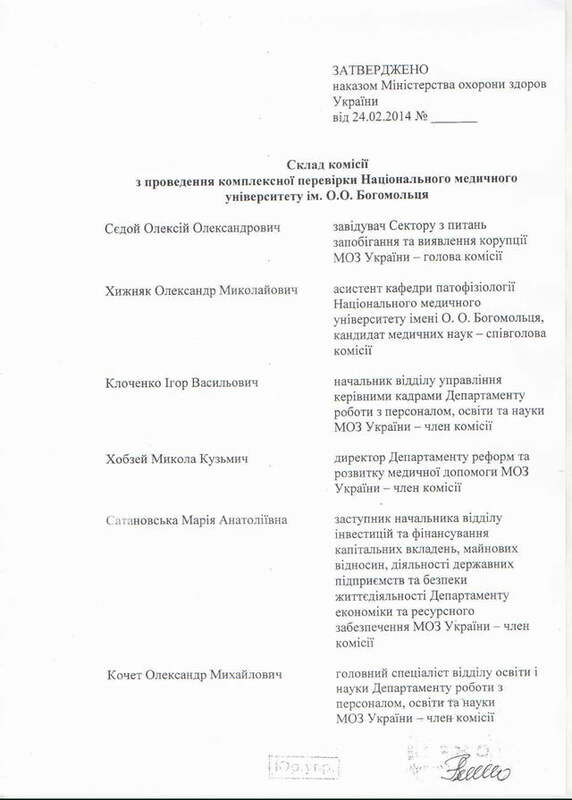 7) Acting Rector, Katerina M. Amosova is to ensure the appropriate conditions for work of the commission and to provide the responsible persons at the request of the chairman and committee members with the necessary information for conducting the commission inspection of the O. O. Bohomolets National Medical University. 8) I lay upon myself the monitoring of compliance with this order. 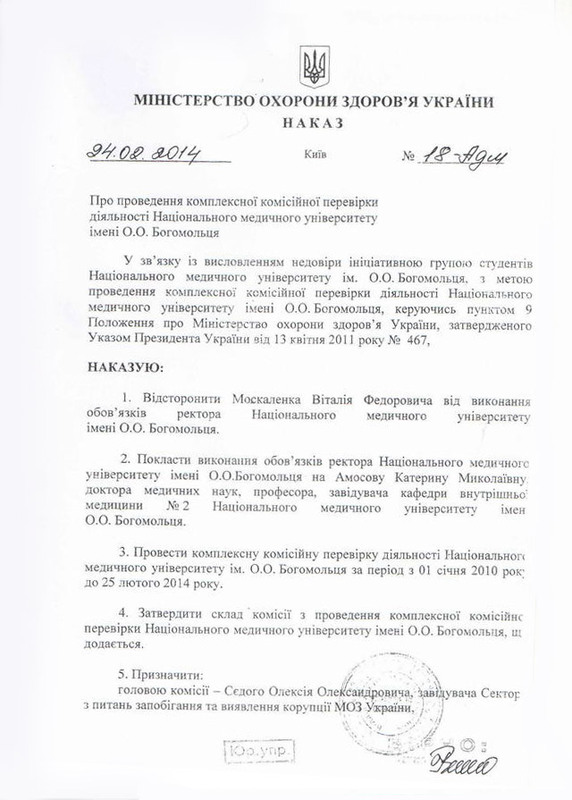 Reason: Letter of the O. O. Bohomolets National Medical University. 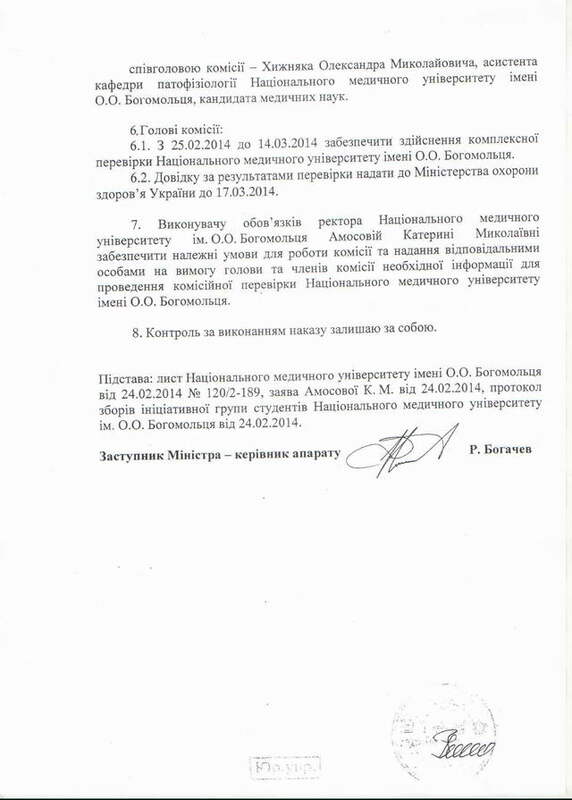 dated 24/02/2014 №120/2-189, the statement of K.M. Amosova dated 24/02/2014 , minutes of the meeting of the initiative group students of the O. O. Bohomolets National Medical University dated 24.02.2014. During the meeting the acting rector of the O. O. Bohomolets National Medical University, Professor K.M. Amosova, the member of the initiative group of students – student of the 5th year of study of the Medical Faculty no. 1 V.P. Motornyi, Deputy Director of the Department for Work with Personnel, Education and Science, Head of the Department of Education and Science of the Ministry of Health of Ukraine, Professor O.P. Volosovets, President of the Ukrainian medical associations V. Aristov, the member of the initiative group of students – student of the 5th year of study of the Medical Faculty no. 2 O.D. Korkishko, Scientific Secretary of the University, Assistant Professor O.I. Kovalchuk, post-graduate student of the Department of Maxillofacial Surgery, A. V. Rybachuk. The university continues its work in normal mode, including training, which is performed under the schedule in accordance with the timetable of the educational process. In the administrative building there is the initiative group of students, several rooms: Rector’s, Vice-Rectors’, the Planning and Financial Office were sealed, the accounting department works partly. The appropriate conditions for work of the Commission on the investigation of the activities National O. O. Bohomolets Medical University were provided, but as of 3 P.M. commission members, representatives of the Ministry of Health of Ukraine did not arrive.